LAST MONTH, I went into detail about safety play for amateurs. For a lot of beginning and intermediate players, it helps immensely to concentrate on controlling just one ball, either the object ball or the cue ball, when you are trying to play safe. This month, I want to cover a topic a little more advanced. It takes a little experience to know when pull back and look for a defensive shot, especially when you have an opportunity to pocket the ball in front of you. Imagine you are at the table shown in Diagram 1. You've got a tough angle on the 5 ball, while the 7 and 9 balls are in a cluster on the other side of the table. You always have a chance of running out, but it's probably not the smartest play, especially when you have the opportunity to play a devastating safety. Last month I suggested focusing on controlling only one ball. In this example, however, you can hide both balls. 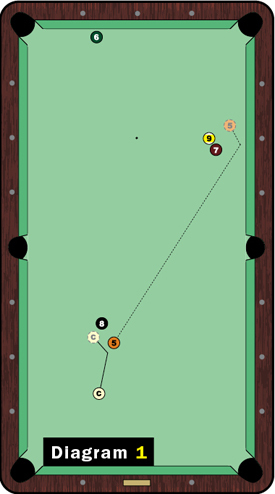 The cue ball will naturally roll behind the 8 if you hit the 5 at the perfect speed and angle to hide it behind the cluster of balls on the other side of the table. For simplicity's sake, focus on putting the 5 in the correct spot. 1. Playing safe: Your first objective is tying up your opponent, which forces him to have to work for a legal hit on the 5. 2. Getting Ball in Hand: If he's unable to hit the 5, you get ball in hand, which keeps you in control and allows you to dictate the next series of shots. 3. Erasing the Cluster: Not only can you get ball in hand, you can also force your opponent into breaking open the 7-9 cluster. Your hope is that your opponent will foul, but still hit the cluster ot break it up. If this happens, you've now got ball in hand and a clean route to victory - three birds with one shot!